As the crow flies, the distance between Greenville, MS and New Orleans, LA is just 300 miles. 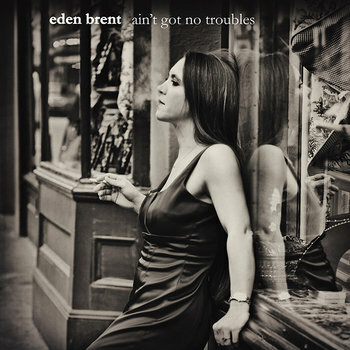 But when pianist Eden Brent traveled from her hometown of Greenville to the Crescent City to record 'Ain't Got No Troubles,' her sophomore album for Yellow Dog Records, she added 100 miles to the journey, eschewing the interstate for the meandering country highways that parallel the Mississippi River's serpentine route. That circuitous road trip, which ended at New Orleans' Piety Street Studios (Elvis Costello & Allen Toussaint, The Blind Boys of Alabama) was a quest to further broaden her sound: Working with bassist George Porter, Jr., she and Linden injected her gritty, rootsy music with spicy elements that earmark the unmistakable Crescent City sound. Brent penned eight of the twelve tracks for her sparkling new album, the most she's written for a single record to date. They exhibit a keen sense of clever wordplay -- the juke joint jumper "In Love With Your Wallet" invokes the wry observations of fellow Mississippi muse Mose Allison, while the vaudeville throwback "My Man" is peppered with double entendre. But there's also considerable nuance: the sly tenderness of the intimate "If I Can't", the after-hours anguish of "Blues All Over," and the soulful, heartbreaking ballad "Leave Me Alone." Brent modestly describes the album's title track as her "tribute to the open, carefree lifestyle of her hometown along the Mississippi river," but it's much more than that: It's a near-iconic blues song that has the singer finding ironic contentment in the things she lacks. No money, no friends, no man -- and, therefore, no worries. It's as pointed a summation of the blues aesthetic as you're likely to hear. Or as another great songwriter once said, "When you ain't got nothin', you got nothin' to lose."